Gandhinagar, Nov 19: A day after the BJP announced its first list of 70 candidates for the Gujarat Assembly elections, resentment built up in the party here, leading to vocal protests as well as resignations by many, including some senior party members. To voice their dissent, several supporters of I.K. Jadeja, a senior party leader and party spokesperson with a strong presence in Wadhwan and Dhrangadhra constituencies in Saurashtra, gathered at the BJP headquarters, 'Shree Kamalam' in Gandhinagar and raised slogans against the party, expressing anger against Jadeja being denied candidature from Wadhwan. 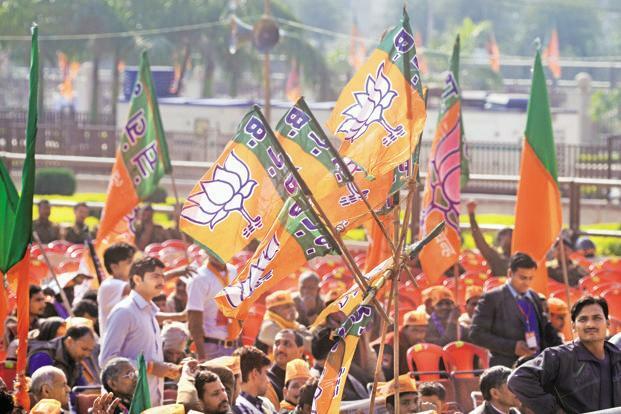 The BJP on Friday had announced the name of an industrialist, Dhanji Patel from Surendranagar district, as its candidate from Wadhwan constituency. Interestingly, Dhanjibhai comes from the same sub-caste as Patidar Anamat Anolan Samiti (PAAS) agitation leader Hardik Patel and the move is believed to be the BJP's attempt to make a dent in Hardik's support base. "My supporting workers of BJP Wadhwan had expressed their desire for me to be fielded from the party for the constituency, including by the people from Dhrangadhra. However, the workers lost patience when an outsider was considered for the ticket," Jadeja told the media. He, however, maintained he was very much in the party and would remain so. However, the supporters of Jadeja now want the party to consider his name for nearby Dhrangadhra constituency. On Saturday, senior BJP leader and sitting legislator of Kodinar constituency from Saurashtra, Jethabhai Solanki, put in his papers, apparently after being denied a ticket. Jethabhai Solanki is a prominent Dalit face of the party and had won the last elections in 2012 by a margin of over 63,300 votes. Jethabhai reached 'Kamalam' and submitted his resignation after meeting the senior party leadership there. "I have decided to resign from the party from all of my posts as I do not want to go out there again and campaign for BJP," he told the media. Resignations and protests by several local leaders from Vadodara, tribal belt of South Gujarat, Navsari, Bharuch, Mahuva, Jasdan and Amreli in Saurashtra have been trickling in since the BJP announced its first list. Many of these leaders have threatened to field independent candidates against the official BJP candidates in the Assembly elections. This is what the party had feared could happen, which prompted the national president Amit Shah to remain stationed at Kamalam till late on Friday night and on Saturday to meet with several leaders in an effort at damage control. The BJP has set up a target of winning over 150 seats for the 182-seat Assembly.